Check out the cover of the new album by The Young Novelists, and you'll find a familiar site for New Brunswickers. 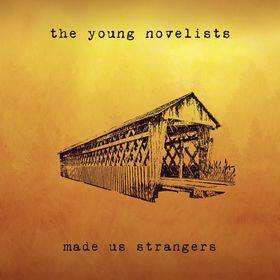 It's called Made Us Strangers, and features a drawing of a covered bridge against a plain yellow background. That's pretty much an iconic image in this province, home to the World's Longest in Hartland, and many more of lesser length but no less appeal. The band's song writer and leader, Graydon James, may be from Ontario, but he shares rural and historic values with smaller centres. Especially covered bridges. "A friend of mine reminded me I once sent them a postcard with a covered bridge on it," says James, in the middle of last-minute tour preps. "I am a big fan of them, and I do know about the longest covered bridge in New Brunswick. It appeals to me, I am a farm boy. Is there a guided tour of all the bridges there? There should be." That kind of roots appreciation extends to the band's music as well. Originally a back-up vehicle for James' song writing, and billed as Graydon James and the Young Novelists, he took his name off the marquee when it became obvious the musical ideas and collective work were making this about a bigger folk-rock sound. That ensemble playing is evident on Made Us Strangers. "This time it felt like everyone came together as a band," James explains. "My feeling was that I wanted an album that felt more cohesive as a band. It was a deliberate idea." It's taken a few years for the group to get to this point. James is also a, yes, a young novelist with one book out and two more on the way. Since 2009, the group has released an E.P., a live album, a first full-length, and now a second, and taken that time to build an approach unique to them. With James' lyrics, there's a strong emotional core that affects the listener on first listen, with all those communal themes. The folk nature of the group has grown closer to rock along the way too. "There is a part of me that likes to rock out," admits James. "I'm not completely a rocking guy, I'm more of a dad-rocking guy, which makes sense now, because I am a dad. But I really like that classic rock side. More of these songs this time have that sound to them. We make a joke on stage, 'Who's ready to mid-tempo rock!'" Then there's the strong harmony vocals throughout. James won't take any credit of vocal chops, he gives all the praise to his band mates, including Laura Spink. The married couple often do shows as just a duo, and its been her voice that has really turned them into a band. "I think the vocals are a huge part of it, I give a huge credit to Laura and Shawn (Jurek, bass), I'm not really trained as a vocalist, and Laura takes me aside and says, 'you have to sing the right note you know'. And Shawn has that great ability to find the third note that blends. It's heart warming." The Young Novelists are all set to warm hearts this week in New Brunswick with shows in Moncton (Plan B, Tuesday May 5) and Fredericton (Capitol Complex, Thursday May 7). Unless, of course, a prolonged tour of covered bridges happens.